FUNNETSTM are made of a unique blend of materials designed specifically for outdoor use. Our heavy body construction is UV treated and is unbreakable. 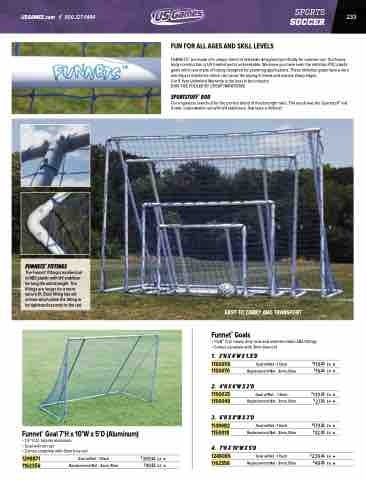 We know you have seen the imitation PVC plastic goals which are made of tubing designed for plumbing applications. These imitation goals have a very low impact resistance which can cause the piping to break and expose sharp edges. Our 5 Year Unlimited Warranty is the best in the industry. DON’T BE FOOLED BY CHEAP IMITATIONS! Our engineers searched for the perfect blend of flex/strength ratio. The result was the Sportstuff® rod. A safe, unbreakable rod with UV stabilizers, that lasts a lifetime! The Funnet® fitting is molded out of ABS plastic with UV stabilizer for long life and strength. The fittings are longer for a more secure fit. Each fitting has set screws which allow the fitting to be tightened securely to the rod.